I headed out to Tooele County today to visit my friend Mary Ruth in Grantsville. I worked in Tooele for three years and lived there for most of 2004, but I haven't been back since I left rather suddenly and moved to Idaho Falls in November of that year. Mary Ruth and I had completely lost touch, but she randomly e-mailed me a couple weeks ago and I wrote back one of those, "Hey, I'm in Utah!" replies. We planned dinner at 6 and it's a long drive to Grantsville, so I thought I'd make a day of it with a ride in the Stansbury Mountains. I took the long way through the town of Tooele just to see what had changed, and felt a little unsettled by my first drive down Main Street in nearly five years. 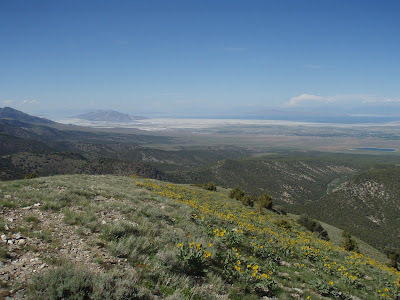 Tooele is the kind of place you can grow to love, but it is what it is ... a strip mall town in a rather desolate valley that's home to a chemical weapons incinerating plant and a big Army depot. I was fairly unhappy when I lived there. I weighed 25 pounds more than I do now, I ate a lot of fast food because I was really busy and watched a fair amount of television because I was burnt out. My relationship (yeah, that relationship) was going nowhere. I rode my touring bike a few times a week, but was fairly bored with the activity. My life in Tooele was mildly toxic. I knew it at the time but didn't know what to do. Today, some of those old sour feelings came bubbling back up from somewhere deep in my gut. It's hard to revisit the places where your life took a wrong turn and wonder if you're currently on a similarly misguided path. 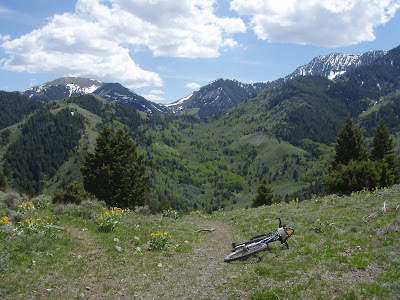 But those unsettled feelings quickly dissolved as I mounted my bike and started pedaling up South Willow Canyon. Hard climbs turn off my brain. Usually, that's a good thing. I stopped at the wilderness boundary and turned around, thinking about the possibility of making it a short ride. 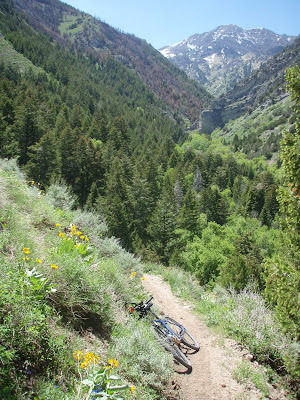 But on the way back down, I stumbled across a sign for the Stansbury Front Trail and veered off. I knew 100 yards into that trail that I was in for a sufferfest. 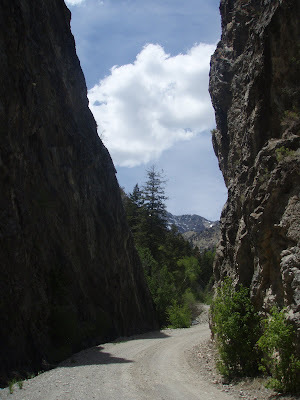 There's not much I can say about the Stansbury Front Trail as a bike trail. 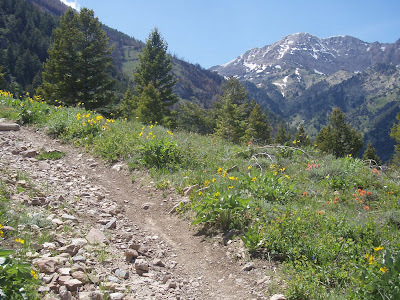 It's technically a trail and bikes are allowed, but unless you're the kind of manimal that can climb 1,000 feet in one mile on rocky, loose dirt, it's really more of a long hike with intermittent terrifying downhill coasting thrown in. I'm pretty sure my shoulders got a better workout than my legs. And that's the reason I stuck with it. The little creek valleys that the trail dropped into were absolutely stunning. I'd throttle the brakes to the bottom and mash the pedals to get as far up the next climb as I could stomach, until my forehead was throbbing and my legs were nearly stalled out. Then, off the bike and walking again, I'd look around at electric green aspen leaves and fields of sunflowers and think about the parts of 2004 that were good ... hiking to the top of Deseret Peak; making a fairly successful go of freelance outdoor writing for local publications; being adopted by an adorable little alley cat. Sometimes it's good to go back to the places where you were unhappy, and realize you really weren't. Interesting thoughts, as always! 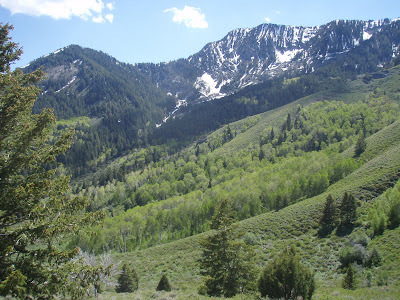 I am loving your Utah pics and stories. I need to get back on my bike again! Awesome photos, your travels make me want to follow your foot steps. 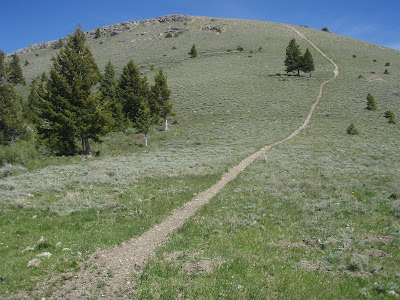 And that trail going up the huge hill...I think I would have a hard time hiking up it let alone biking up it...kudo's to you! I have a dumb question.....I know you love Alaska but are you conflicted about going back since lots of your friends and family are in Utah? I love how you are confronting a lot of your past life (even though you are still young :) ) and learning and growing from it. You are going to be a whole different person once this journey ends for you. Stay strong! Beautiful country Jill! Happy you enjoying yourself. 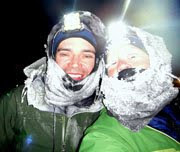 How are your Tour Divide plans coming? I'm out of breath and my knees are sore just looking at the fourth pic. But the photos are great as usual. Keep striving forward you'll make it. I dropped by your SPOT page yesterday and noticed you were on a nice ride. Checked a few hours later and saw you going up the side trail. Spot's satellite view was impressive but pales next to your pics! For a little 'ole mountain range them Stansburys is sweet! Jill, thank you for writing so well and so consistently. I broke my arm last month and your blog has been a big help in keeping me sane off the bike. Holy crow - if this journey is not the best hing you can do for yourself I do not know what is - all of that friggin beautiful landscape has to heal the soul. SUHWEEEEEEEEEET! Jill, I know you are going through some interesting times but I must compliment you that you are really hitting your stride as a writer. This period that you are spending in Utah has really been something to read about. Very good stuff! Stay safe out there! I just recently came across your blog, so I wanted to let you know how much I'm enjoying your posts. Your photos are fantastic, and you really decribe the adventure of taking long rides beautifully. I added "Up in Alaska" to the sidebar of my own blog, and I mention it in my May 27 post. Again, great job! Times are too complicated. Try Shimano spds and lighten the tension on the pedals. I was skeptical of clipless until I saw pictures of downhill racers, laying their bikes side ways and doing dabs. With Shimanos any time you have pressure down on the pedals your feet slip out instinctively and easily and with a twist of your heal. With any clipless things get tricky when you are going uphill and stall. At this point it takes some concentration to get your foot out and not fall over. I don't recommend Crank brothers for newbies. They are not as easy. I have a set that I use with my winter riding shoes and they are much harder getting out of than spds. But Crank brothers don't clog in the wet snow and frozen mud like spds do and that's why I have a set.